Skull of Phineas Gage by LabsOfCognitiveNeuroscience is licensed under the Creative Commons - Attribution - Share Alike license. Shown printed at 1:1 (white) and 3:4 scale (gray). Please post photos if you print this model. I'm excited to see others print this. Phineas Gage became the center of a landmark neuroscience case when an explosion forced a red-hot tamping iron through this railroad foreman’s brain and skull. He survived, but reportedly suffered a personality change. This was the first evidence suggesting that the frontal lobe of the brain was linked to one’s personality. A more complete story is hosted at the website of the Warren Anatomical Museum at Harvard Medical School, which happens to be the current home of the original skull. It’s a fascinating case and an even more fascinating artifact. 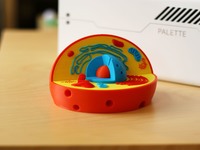 This anatomically accurate model can be printed to enable hands on exploration or to provide a source of inspiration. A full scale version has been printed. 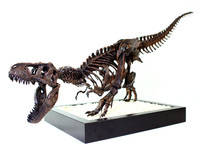 New photos have been uploaded comparing the 3/4 scale and full scale versions. Two files of the model sliced vertically are included as these may be easier for some people to print. This work is a derivative of the CT scan made of the Phineas Gage Skull as discussed in The Tale of Phineas Gage, digitally remastered (Ratiu, P et. al., 2004), and is being shared with the kind permission of the Warren Anatomical Museum at Harvard Medical School’s Countway Library. Marianna Jakab of the Surgical Planning Laboratory within the Department of Radiology at Brigham and Woman’s Hospital for providing the original CT scan files and for interesting stories shared over a cup of tea. Peter Ratiu, first author of The tale of Phineas Gage, digitally remastered, for his efforts to scan and explore this fascinating artifact as well as for his thoughts regarding this project. Dominic Hall of the Warren Anatomical Museum for his enthusiasm for this project and for his kind permission to post this model. Ratiu, P., Talos, I. F., Haker, S., Lieberman, D., & Everett, P. (2004). The tale of Phineas Gage, digitally remastered. Journal of neurotrauma, 21(5), 637-643. The more delicate bone structures don't do well when you scale this model down too far. You can get an interesting conversation piece at 50%, but I think that printing at 75% results in a nice model with a good level of detail. This has been printed at 50% in one piece, but I recommend printing it in 2 pieces. There will be a fair amount of support material to remove after printing this model. 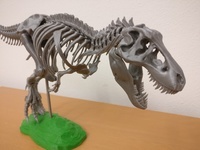 Just be careful of the delicate bone structures on the underside of the bottom half of the model. If you printed the model in two parts, you'll probably want a way to hold the pieces together. I ended up doing the quick and easy thing by taking a strip of gaffer's tape, folding it over and running along the inside of the bottom half of the skull. This way the top half stays on fairly well, but you can still take it apart for exploration. I've also included a small stand to help the skull stand up. Say thanks by giving LabsOfCognitiveNeuroscience a tip and help them continue to share amazing Things with the Thingiverse community. Say thanks and help LabsOfCognitiveNeuroscience continue to share amazing Things with the Thingiverse community. You'll need a PayPal account to tip LabsOfCognitiveNeuroscience. Click the button below and you will be redirected to PayPal. Once the payment is complete, you'll be brought back to Thingiverse.